Low prices. OrangeSmile.com offers car hire service in Hungary on the lowest-rate-guarantee basis, since we work with car suppliers directly. 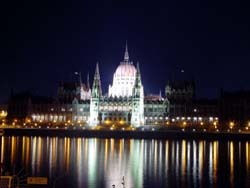 For your search criteria in Hungary, we always select and show the best rental offers. The car reservation process consists of 3 simple steps: (1) search for available cars for your dates in Hungary; (2) select your car type; and (3) fill in the booking forms. Once the reservation is completed, you will receive a confirmation voucher to your email address. During the booking process, please check your rental conditions. To pick up your car at the rental point in Hungary, you need to provide our confirmation voucher, your driving license and a valid credit card. The final payment is normally carried out at the pick-up point. Our car hire points in Hungary accept VISA, MasterCard, etc - please check your rental conditions. At the pick-up point, please read the handling manual and check the car for present defects. OrangeSmile.com wishes you a pleasant journey to Hungary! The car hire reservation system OrangeSmile.com allows renting a vehicle in Hungary within 10 minutes. Our largest database of car suppliers enables us to provide you a rental car in Hungary at the cheapest rate ever possible. At rental locations in Hungary we offer the following car sizes: mini, compact, economy, standard, premium and luxury. The following car types are available in Hungary: Sedan, Hatchback, Jeep, Cabriolet, Coupe, Minivan and Minibus. In Hungary, tourists will find a great choice of historic, architectural and nature landmarks. Old cities of the country are home to numerous interesting places, museums and exhibitions. Suburbs and rural areas are no less interesting as there are many nature parks and reserves that never cease to amaze travellers. The village of Vijoi is an interesting historic and religious destination in Hungary. One of churches in the village exhibits a priceless artefact. This is the first printed Bible that was published by one of local typographies. When it comes to describing nature landmarks of the country, we ought to start from Bugac Nature Park, which total square exceeds 11 thousand hectares. Every day interesting shows and performances take place in the park to entertain numerous visitors. There are also several rides and taverns decorated in retro style. Gemenc Forest is a unique place with rich flora and fauna. Here tourists have a rare chance to see rare plants, wild animals and birds. It’s possible to participate in a walking excursion and enjoy the beauty of the forest during a river voyage. Hortobágyi National Park is the third most important reserve in the country. This park is located in a steep area, so visitors will be amazed by large steep valleys with herds of cows, sheep, bulls and horses. The town of Ipolytarnoc has become a true gem for zoologists. Long time ago, this area was covered with massive rivers. With time, the rivers dried, leaving only piles of petrified mud. This mud is a treasure for scientists as it still has traces of ancient animals, many of which have disappeared thousands of years ago. Petrified trees are one more precious finding in the area. Today, they are exhibited in one of local pavilions. Nadudvar is a famous town known as a centre of pottery in Hungary. During more than two hundred years best pottery in the country is made in Nadudvar. Local craftsmen never cease to amaze travellers with their skilful and beautiful artworks. The most precious items were transferred to large galleries and art museums across Hungary. Finally, the town of Körös-Maros is an interesting place with modern buildings, several entertainment centres, movie theatres and shopping centres. However, the local national park remains the biggest attraction of the region. Körös-Maros is considered one of the noisiest towns in Hungary and attracts visitors with its rich choice of entertainment. If your routes are to be mostly in the city, consider hiring a compact vehicle. It will be quite difficult to maneuver in a heavy traffic and find parking slot in Hungary in a large car. The damage to the car body, wheels and windows, caused in non-accident situation, is not covered by the CDW insurance package. These damages can be insured at the rental office in Hungary, by ordering a complete coverage package.